WORLDWIDE: When times are tough, it is only natural to cut down on unnecessary spending and try to make the best out of what you already own - be it a house, a car or a wind turbine. Wind-farm owners, many of them developers and utilities that have historically focused on building new projects rather than on maintenance issues, are finding this principle of "mend and make do" increasingly relevant. As they struggle to raise financing for new projects, or simply seek to avoid the risk of making a major investment in an uncertain economic climate, wind farms owners are instead looking to the less risky and less capital-intensive process of upgrading their existing turbines through retrofitting. In response, many original equipment manufacturers (OEMs) are reconsidering their own business strategies, which until recently were almost solely focused on the production of new machines. "Traditionally in the wind industry manufacturers were taking their margins on the sales of turbines and price of the service was comparatively cheap compared to turbine prices at the time," says Christian Jourdain, global marketing manager at turbine manufacturer Gamesa. This treatment of turbine servicing as an add-on is looking increasingly obsolete in a market where new turbine orders are in freefall, says Jourdain, while the number of out-of-warranty turbines in operation is rising steadily to an industrial scale - there are currently more than 70GW of turbines around the world that have been running for more than five years. As a result, OEMs are having to revive old relationships to help their business survive, says Kristian Kjaerholm, business development manager at Mita-Teknik, a global supplier of control systems for wind turbines. The opportunity for sales on top of basic turbine maintenance deals is now increasingly likely to come through offering clients component upgrades rather than selling entire new turbines either for new projects or for the repowering of existing wind farms. "During the high market of 2006-07, the focus was on new projects and larger projects, not old customers," says Kjaerholm. "Now OEMs would like to get a contract with old customers in order to get service upgrade deals." Jourdain says that turbines' operational lives can be extended by as much as ten years through upgrading components and technologies such as monitoring systems, giving some turbines a potential lifespan of 30 years. The client gains up to ten years additional revenue for a fraction of the cost of investing in new turbines. Also, by upgrading to state-of-the-art technology the turbine's efficiency and performance will improve, which cuts running costs and keeps them low over the long term. This is particularly important for projects where previous feed-in tariffs (FIT) have passed their output or time limit, where upgrading can improve output and longevity beyond those limits, Jourdain says. "The aim of the life extension programme is to ensure we make the upgrades that allow our clients to be profitable," says Jourdain. "Governments may provide you with a FIT up to a certain output limit, so we need to make sure that the additional output we are providing with the upgrade is competitive with market price." In other words, retrofitting helps make wind turbines competitive with other forms of electricity generation without subsidies - a task made easier by the fact that if the retrofit happens around year 15 of a turbine's operational life, for example, the project's initial capital outlay has been largely paid off and fuel is, of course, free. For companies still paying off the loans taken out to finance a project, extending a turbine's life and improving its performance through retrofitting could reduce the cost of loan repayments, says Jourdain, improving the developer's cash flow. "Potentially they might be able to renegotiate their project loan," he says. "For example, with turbines on a 12-year-old project, developers might be able to improve their cash flow by negotiating with their lenders to spread repayments over more years now that, following the retrofitting and upgrade, the turbine is predicted to operate for 30 years rather than 20 years." This financial benefit is more likely to be of interest to independent developers, but upgrading components can also bring a significant boon to utilities, says Jourdain. "For the big corporations it's a great way to improve their balance sheet," he says. "Life extension of wind farm assets also allows an automatic increase in the company's asset value, potentially raising it by 33% for five-year-old turbines to 100% in the case of 15-year-old turbines. The total value of the company equity and the profits increase automatically with no need for investment as asset amortisation and financial costs are spread over a wider period." Gamesa's retrofitting strategy is centred on the mechanical elements of a turbine. "If you want to extend the life of the turbine you have to work on the structure - the foundation, blades, and gearboxes," Jourdain says. This may come either through the reconditioning of a component, which Jourdain says could increase its lifespan by several years, or its replacement with new technology, which could extend the life of a turbine by up to a decade. Reconditioning a turbine gearbox can involve realigning the gear geometry, replacing the existing bearings with a different design, and changing auxiliary systems connected to the gearbox to improve working conditions. This can be done for a fraction of the cost of replacing it with newer technology, but will not offer the same level of performance or longevity. Jourdain says both approaches are appealing to different clients. Utilities tend to want the bigger, more expensive solutions, whereas small wind farm owners may be short of money and will go for the cheapest solution - a reconditioned turbine. "There are some that might buy the minimum upgrade solution and wait and see because they are struggling - but the investors and utilities have the long-term view that they want to get the most out of the turbine," Jourdain says. 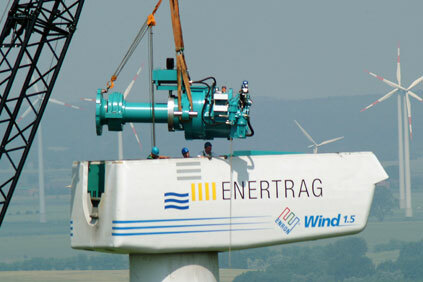 The type of upgrade solution will also depend on individual factors specific to each turbine. One that has been well maintained during its operational life is more likely to be better suited to reconditioning than one that has been given only minimum maintenance. There are also site-specific gains that can be made, where the turbine has been operating on a misalignment and more modern turbine control technology can help realignment and, in some cases, improve a turbine's performance dramatically, Kjaerholm says. In particular, unsophisticated control technology on older turbines meant that on safety grounds they were only permitted to operate at a fraction of the wind speeds that their components were physically capable of handling. "I was in Palm Springs, California, recently (where many of the earliest turbines are based), and many of the turbines there are in great physical shape and quite simple from a mechanical standpoint," Kjaerholm recalls. "They have had many years of under-engineered operation, whereas nowadays turbines are engineered to the edge." As a result, the installation of more modern control systems and sensor technology can provide the safeguards that allow the turbines to operate safely at the upper limits of what they are capable of. Mita Teknik entered the retrofitting business following hundreds of requests from owners of out-of-warranty turbines. There are various reasons why wind-farm owners approach a control systems supplier for potential upgrades for their projects, says Kjaerholm. One is that owners do not believe they are getting the most out of their turbines but do not have the money or the will to replace the turbine, called repowering, so they are looking to improve their existing fleet. Another reason may be that owners of older turbines that no longer have spare parts available want to replace these parts with more modern components before something breaks and they are unable to fix it. The key markets for retrofitting, agree Kjaerholm and Jourdain, are those countries with large numbers of turbines that have been operating for more than five years: the US and many European countries, especially Denmark, Germany and Spain. However, these markets are not without risks. Jourdain points out the large number of turbines in Germany developed at the community level. "It can get very complicated with thousands of customers," he says. "Customers who are, for example, communities with just one old turbine, not utilities with hundreds. "Maybe an alliance of small wind-farm owners could seek to retrofit their turbines together, in order to make the retrofitting more economically efficient. It's hard to say; we are really at the beginning of this." As complicated as it may be in some areas, both Jourdain and Kjaerholm are confident that this is an area that will continue to grow, and not just in the US and Europe. In China, the world's largest wind market, it is estimated that the post-warranty maintenance market alone will be worth more than CNY 100 billion ($16 billion) by 2020 as new builds slow. By then, many of China's wind farm owners will also be looking to maximise their investments by improving their turbines and extending their lifespan. Accumulated wear and tear in older turbines might result in less reliable functioning and reduced operating efficiency. This could through mechanical, electrical, hydraulic or power-electronics-related causes affecting one or more components or systems. Wind turbine failure rates do not automatically relate to the same components or systems, but instead identify weak links in specific makes and models. When choosing a solution for a failed turbine, a clear distinction should be made between basic repairs and extensive retrofits with or without a system upgrade. Typical candidates suitable for retrofitting include gearboxes, generators and rotor blades. Worn-out bearings are normally beyond repair and have to be exchanged. Gearbox issues tend to start with bearings failure, and without timely intervention gears will become affected too. Catastrophic gearbox failure is a worst-case scenario for a turbine owner, and could add worn-out bearing seats, damaged shafts and cracked castings. For generator and other bearings, initial neglect can have serious and costly consequences. Timely retrofitting saves on money and downtime. Low-speed direct-drive turbines commonly feature a stationary shaft (pin) and two bearings, or a large-diameter single rotor bearing. With single rotor bearings the "fast-wearing" oil/grease seals can often be exchanged. The exchange and retrofitting of burned direct-drive generators is costly, and modular designs with individually exchangeable sections or segments are on the increase. Rotor blades regularly develop erosion-related wear at their rounded leading edge, while mechanical damages can occur at the vulnerable trailing edge and tip section. Lightning strikes are another common cause of blade-tip damage, while fatigue-related cracks could develop in the blade foot. Uncontrolled open-air repairs - either at the turbine or on the ground - generally do not produce lasting results, and the trend is towards high-tech repairs and complete retrofits both under climate-controlled conditions. Turbines developed decades ago can benefit substantially from technology upgrades, and can be an integral part of lifetime extension programmes. One example is the fitting of a modern power-electronic converter, control system and new gearbox in a kilowatt-class two-bladed variable-speed turbine developed over two decades ago. Another reported project by German wind developer Energiekontor involves fitting rotor blade extensions to 1MW and 1.3MW Bonus turbines (now Siemens), which is claimed to boost annual yields by 5-10% while remaining within the original product-design limits. Retrofitting aims to boost an existing turbine's efficiency and extend its lifespan by replacing one or more components, such as gearboxes and rotor blades, with more up-to-date versions and/or fitting the turbine with modern control systems. Repowering, which involves decommissioning an existing turbine and replacing it with a new, usually higher-rated version, is a more costly option. A repowering project may encompass replacing one or all of a wind farm's turbines with bigger models, which will increase the project's output while lowering operating and maintenance costs. Repowering can be a popular choice in markets where all the windiest sites have already been developed, such as in Germany and Denmark. Repowering options, however, can be limited by permitting constraints, such as installation height restrictions and/or limited grid capacity.